Matthew and I hanging out with Zack Myers of Shinedown and Chris Robertson of Black Stone Cherry on August 10, 2016 before Carnival of Madness. An amazing concert at the Merriweather Post Pavilion in Maryland. 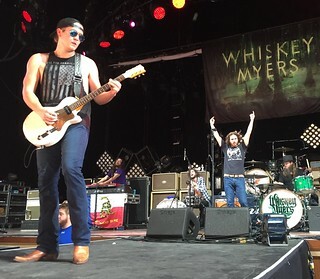 The concert opened with Whiskey Myers. A band I’d never heard of, but enjoyed. Next in line was Black Stone Cherry who played several of my favorites songs including Blind Man, In My Blood and Lonely Train. Hailstorm rocked the house next. Been waiting a long time to see Hailstorm! Checked. And then, perhaps my favorite band behind the Bealtes .. 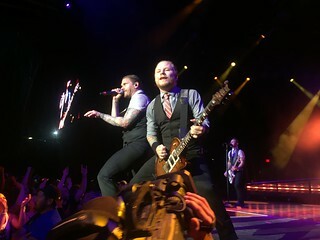 Shinedown!!!! Whiskey Myers: Early Morning Shakedown, Mud, Home, Headstone, and How Far. 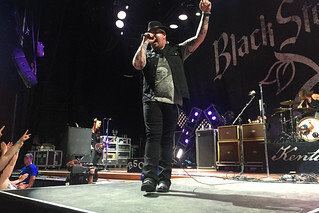 Black Stone Cherry: Me and Mary Jane, Blind Man, In My Blood, Cheaper to Drink Alone, Soul Machine, Blame It On The Boom Boom, Lonely Train, then closed with Ace of Spades by Moorhead. Halestorm: Love Bites (So Do I), Mz. Hyde, Apocalyptica, Amen, I Like It Heavy, I Am The Fire, I Get Off, Freak Like Me, Mayhem, and I Miss The Misery. 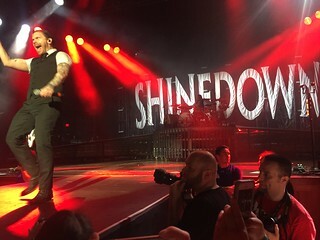 Shinedown: Adrenaline, Fly From The Inside, Diamond Eyes (Boom Lay Boom), Unity, Asking For It, Unity, If You Only Knew, Enemies, Call Me, cover of Radiohead’s Creep, I’ll Follow You, 45, State of My Head, Second Chance, Cut the Chord, Simple Man, and Sound of Madness. As far as covering new albums Hailstorm did the best with half their set coming from their new album Into the Wildlife: Apocalyptic, Amen, I Like It Heavy, I Am there Fire, and Mayhem. Black Stone Cheery played Cheaper to Drink Alone, and Soul Machine from Kentucky. 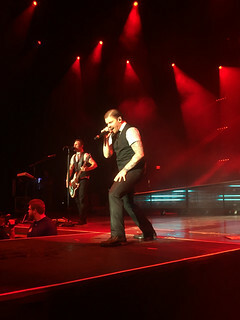 Shinedown played three from their new album Threat to Survival: State of My Head, Asking for It, and Cut the Chord. They are both amazing groups, although it’s interesting how they differ in approach to touring. 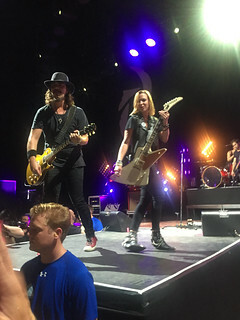 Halestorm is the party band where Shinedown reminds me of what U2 may have been like in their earlier, more serious days. Shinedown is probably my number 2 band behind the Beatles. Both those songs are on my cycle list as well. Such a great energy.